Prime Minister and Chairman of the National Coalition Party Jyrki Katainen at the party's National Executive Committee in Helsinki on Saturday. Photo – Str / Lehtikuva. 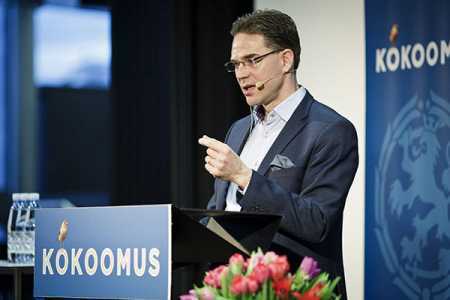 Prime Minister Jyrki Katainen on Saturday said the proposed €3bn budget adjustment was too huge and might act as an impediment to economic growth. Speaking at a council meeting of the Kansallinen Kokoomus (national coalition party), the biggest component of the six-party ruling alliance, the premier observed that implementation of such a large deficit adjustment at once would lead to zero economic growth. “Economic growth for the next year has been estimated at 1.8%. Having a €3bn budget adjustment would bring it down closer to zero,” said the prime minister. The premier pointed out that there was a need for making concrete decisions in March on measures to control the debt. According to the PM, the government was still considering whether the budget adjustment should be carried out within the next year or should it be spread over a number of years. The government intends to put its finances in order by further hiking taxes and cutting government spending.